In our Catholic faith, the seven sacraments are of three basic types: Initiation (Baptism, Eucharist, and Confirmation), Healing (Reconciliation and Anointing), and Vocation (Matrimony and Holy Orders). If you would like to have your child baptized, please contact the parish office. For further information, please visit our Baptism page. In any relationship, hurts can build up, leading us to need to "clear the air." In our relationship with the Lord, we regularly need to reckon with what has happened, face our true situation, seek God's plentiful forgiveness, and go forward with intent to learn and change. For Catholics, the Sacrament of Reconciliation is our way of connecting with our loving Father's mercy, grace, and peace. Our parish priest offers Reconciliation weekly on Saturdays from 3:15 until 3:45 pm and at other times by appointment. During the seasons of Advent and Lent check the parish bulletin for for other opportunities for Reconciliation. If your health does not permit you to come to church for Reconciliation, please call the parish office. Our parish priest will visit you. Our Religious Education program prepares children in Grade 2 to receive Reconciliation for the first time. First Reconciliation takes place in December, during the Advent season. We regard this event as a celebration of God's loving mercy and forgiveness. Watch the bulletin for announcements about meetings to help prepare parents and students for this joyful day. Christ founded the Sacrament of the Eucharist at the Last Supper. He broke bread and said "This is my body"; and later, "This is the cup of my blood." What did he mean? We call the Eucharist a mystery because we do not presume to know the full depth and meaning of Christ's words. Perhaps most mysterious of all was his command: "Do this in memory of me." We do as he commanded and trust that in some miraculous way, the bread and wine truly become his body and his blood. For us, the Eucharist is genuinely and vividly our Lord in our midst. So of course the Eucharist is central to our lives. Please join us at any of our daily and weekend Masses (schedule). If your health does not permit you to come to Mass, please call the parish office. We would like to bring the Eucharist to you. You may also wish to participate in the weekly television Mass celebrated by the Diocese of La Crosse and broadcast at 9:30 each Sunday morning. 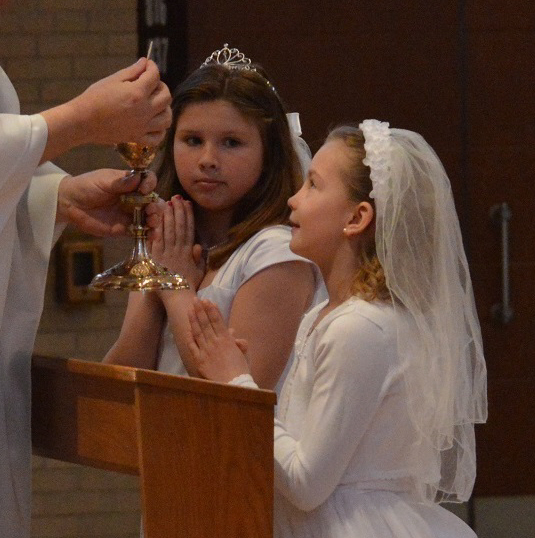 Our Religious Education program prepares children in Grade 2 to receive the Eucharist for the first time. First Eucharist takes place on a Sunday during the Easter season. Watch the bulletin for announcements about meetings to help prepare parents and students for this joyful day. Confirmation is the Catholic sacrament of initiation into adult discipleship. Our Grade 9-10 Confirmation program prepares students for the sacrament of Confirmation in their 10th grade year. The process involves service, ministry, reflection, mini-retreats, and other scrutiny. Confirmation takes place in the Spring; the specific date usually depends on the bishop's schedule. In an emergency, call our parish priest at 608.788.5483, ext. 7. If he is away from the Rectory, your call will be transferred to his cell phone. If you or a loved one will be in the hospital, please tell the Pastoral Care Department to call MMOC. Because of federal laws on privacy in health care, the hospital will not notify MMOC unless you ask them to do so. Our pastoral staff (Fr. Konopa, Sr. Kathy, and Therese van Oss) would like to visit you in the hospital if you wish, to bring you the sacraments and pray with you. Several times each year we hold a communal anointing service. Watch for an announcement in the bulletin. Are you thinking about getting married? Please visit our Wedding Resources page. If you would like to talk about a possible vocation for yourself or your child, please talk with our pastor, Fr. Brian Konopa.